Five years ago we traveled on what we expected to be THE once-in-a-lifetime trip – an African Safari! But safaris are addictive, and with retirement and a big birthday to celebrate we decided to splurge on a second trip. 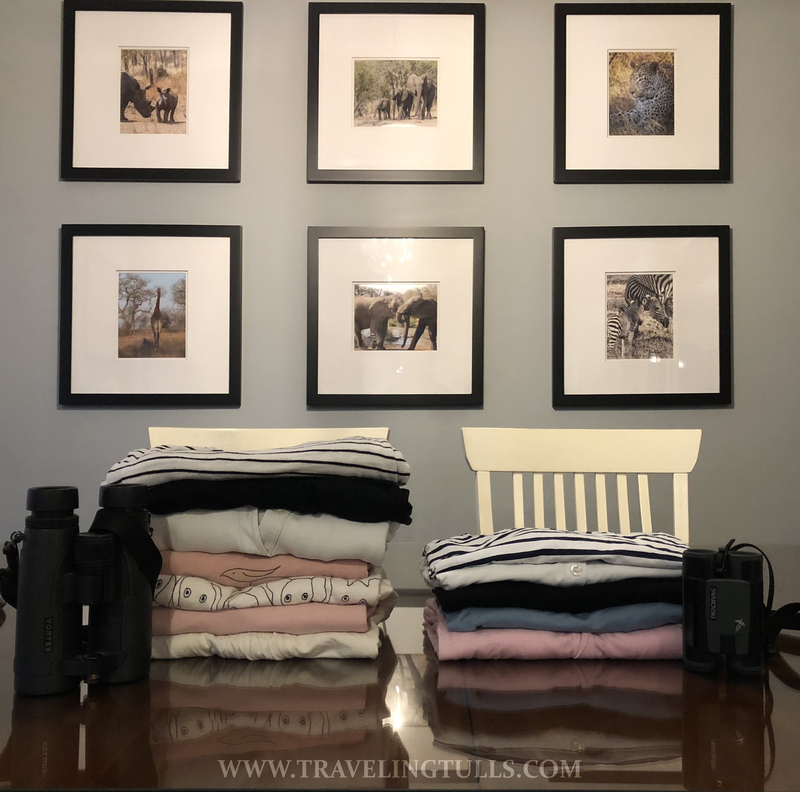 We contacted Rhino Africa again [see review: Rhino Africa – our Choice for an African Safari], decided on our itinerary, prepared our reading lists, and are now focusing on packing. Which brings me to a confession… As social media so often skips over the difficulties of life, we didn’t dwell on the near hysteria I felt when our luggage was deemed over-sized before leaving Boston. We chose to leave out descriptions of me wrestling with the gate agent when she took my bag away, or me running back out of the plane to rummage through my sadly abandoned bag for any medications and documents I might need en-route. We skipped over the fact that my husband’s bag broke halfway through the trip. And we neglected to mention the extra set of binoculars (1.6 lbs) that we carried unused over 19,000 miles of travel. We have learned some packing wisdom in the past few years, but perhaps more importantly, we have begun buying products that work well for travel – travel sized tech products, lightweight but sturdy luggage, and merino wool clothing. These ‘specialized’ items are often expensive, but we watch for sales and signed up for alerts for off-season items on websites like sierratradingpost.com and similar. Zip top shop bag folded within duffel will become our personal carry-on for the trip home. Swarovski CL 8 x 30 pocket binoculars – at 1 lb., 1 oz. we saved 9 ounces from our Vortex Talon (an at-home favorite) and the optics are AMAZING! Osprey Trailkit Duffel/Backpack – 40 L carry-on luggage – checked on return flight. We hope to upgrade this duffel if we’re able. See our review of the Osprey Trailkit. If you are traveling to Kenya or Rwanda, note that plastic bags are illegal. Travel Insurance information – Travel Insurance is a must for a safari. Camera wrap or bag insert to eliminate the need for a dedicated camera bag (unless you plan on carrying more than one camera body and lens). The insert can go in your carry-on bag, and can be put into a smaller bag on safari. We use a basic wrap for our dSLR but also pack in an Ape Case cubeze insert. Prescription medicine – leave in labeled bottles if possible. Take a copy of your prescription with you. Bush bathroom helpers – toilet paper, wipes, (Amazon offers a packaged set including toilet seat covers call the Restroom Kit) The ladies might want to bring a Go-Girl for easier ‘going’ mid game drive. Almost all toiletries, shampoo, etc., will be available in camp. Choose clothing in earth tones for safaris. Game drives are dusty and subtle colors are less likely to disturb wildlife. This is especially important for safaris in East Africa where tsetse flies are found. These flies, which carry diseases, are attracted to black and bright blue! No camouflage clothing! It’s actually illegal in some countries. Amy recommends Diane Kroe items: the Carry-On Cozy (as a scarf, skirt, AND poncho! ), and Wanderlust as a convertible sweater (and airplane blanket! ), Encircled dressy sweatpants for travel days and dinners, and Lands’ End pack-able puff jacket which compresses to next to nothing in a small Eagle Creek compression cube. *NOTE: we use Sawyer’s permethrin to treat our clothing. Saturate the clothing (outdoors) and allow to dry. Insect repellent should last for 6 washings. 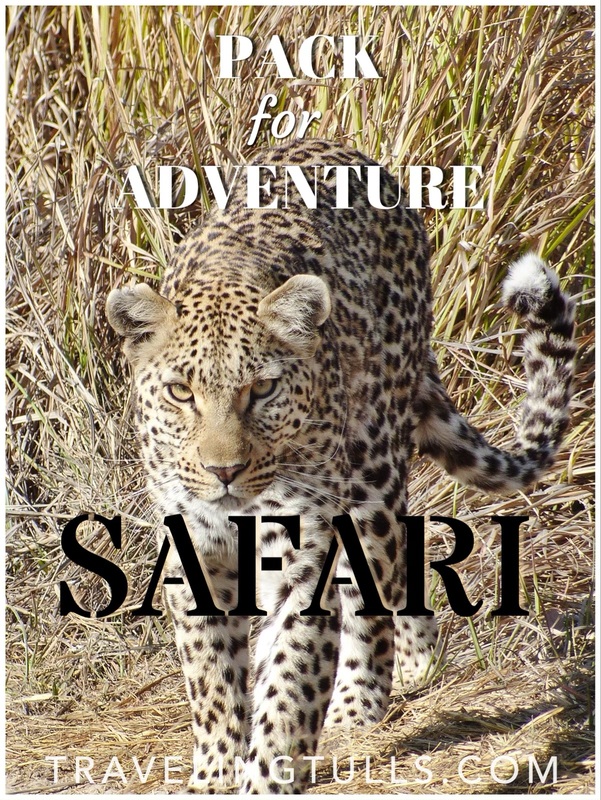 Posted on February 3, 2019 April 19, 2019 by TravelingTullsPosted in Africa, Journey African Safari, Pack for Adventure, Packing Lists, Travel ClothingTagged carry-on, Diane Kroe, Encircled, Icebreaker, Lands' End, osprey packs, packing light, packing list, Rhino Africa, safari, safari packing, tom bihn, travel clothing. We learn the hard way don’t we? We travel with carry on 90% of the time. We did one month in Africa plus taking our cycling shoes and pedals. We rented helmets there. It takes work but well worth the effort in planning ahead. OK I’m seriously impressed that you could do that with cycling gear too! We haven’t rented helmets yet though so maybe that would help.